A conlang is a constructed language— an invented language. J. R. R. Tolkien famously invented the Elvish language, and thought of language construction as his secret vice. I’m fond of conlangs, but prefer to use ones constructed by someone else to making one up myself. It’s a lot of work, and for a writer, you will only use your conlang to create a few names and perhaps a stray word or phrase or two. So it’s always an option to use a conlang ‘off the shelf’ if you can find one that suits your purpose. What conlangs are available for writers to use? Usually it’s the ones that were invented as auxiliary languages for international use. Conlangs like Klingon or Tolkien’s Elvish are the intellectual property of the creators. Here are 7 known conlangs that are available for writers to use, since they are/were IALs (International Auxiliary Languages) and in most cases, are older IALs. Esperanto. Invented in 1887 by L. L. Zamenhof. The most successful IAL, there are books published in it, shortwave radio broadcasts given, and annual Esperanto conventions. It is recognizable as a European language and people who speak one of the Latin-derived languages like Spanish, Italian or French can often understand Esperanto sentences without learning the language. In my Destine series, Esperanto is the primary conlang used by the Terran Fleet. Ido. Invented in 1907 by Louis Couturat. This was intended as ‘reforms’ to Esperanto, in part by getting rid of the ‘ugly’ Esperanto words with Germanic or Slavic roots and replacing them with Latin-origin terms. Today Ido is well known mainly to Esperanto speakers. There is still an Ido movement, but it is small. Ido is recognizable as a European language, and an Esperanto speaker can mostly understand Ido. It may be considered an Esperanto dialect. In the Destine series, the main use of Ido is on worlds where two dialects of conlangs are considered desirable, often spoken by differing tribes or social castes. It is also spoken widely by people who resent having to learn Esperanto but must deal with Esperanto-speaking people. Universalglot. Invented in 1868 by Jean Pirro. This language predates Esperanto, but never had clubs or a movement, or even a translation of the Our Father. It looks like a European, Latin-based language. In the Destine universe, Universalglot is the preferred Trade Language of the powerful Konju race. Since Konju people mostly cannot learn languages after childhood, many people learn Universalglot to trade with the Konju. Solresol. Invented in 1866 by Jean Sudre. Solresol is rather famous for being a language based on the musical notes of the scale. You know, do, re, mi, fa, sol, la, si…. Each of the seven possible syllables of Solresol has a corresponding musical note, color, number, hand sign (sign language) and glyph. What’s not to love about that? It is a very alien-looking language, but in longer Solresol utterances it might even be recognized by clever readers as Solresol, since the language is still sometimes mentioned in books and other information sources. In the Destine universe, Solresol is used by a few alien races, often in a rudimentary way, and is also used as a secondary Trade Language by musicians and artists. The alien Tsanan race, who have the form of balls of colored light, love Solresol since they can match their body colors to the syllables of Solresol. Amerysk. Invented in 1974 by Paal-Erik Filssunu. Amerysk was invented by an American Odinist, and I got a mimeographed booklet on Amerysk from an Odinist friend. I have not been able to contact the creator of Amerysk and have been in contact with another speaker only fleetingly, many years ago. I put the booklet up online in various places many years ago. I’ve also been adding words to the language for some time and posting it on a blog. Amerysk is a Germanic language, like modern English, old Anglo-Saxon, and German, Swedish, Yiddish and the like. In the Destine universe, Amerysk is commonly spoken in regions on the planet Mayflower, and by small human groups elsewhere. There may be aliens who prefer it, as well. It’s fairly common as a second or third language for the elders of Amish communities in space, since it is related to their German dialect. Slovio. Invented in 1999 by Mark Hucko. Slovio is a pan-Slavic language. The creator says that if you know Slovio, you can communicate with all the world’s Slavic language speakers— Russian, Polish, Croatian…. It may be true, but if you say something to a Russian in Slovio and he understands it, he will answer in Russian, which you won’t understand fully. It is a Slavic-sounding language and can be written in both Roman (like English) and Cyrillic (like Russian) alphabets— which is kind of like Serbian which uses both alphabets. In the Destine universe, Slovio is preferred by Slavic-language speakers. A few minor alien races use it, too. Volapük. Invented in 1879 by Father Johann Martin Schleyer. Volapük was the first IAL to get a following, and clubs, and a movement. It’s a complicated language, though. Many Volapük clubs became Esperanto clubs when Esperanto was published and gained a following, since Esperanto is easier to learn. But maybe the complications of Volapük were necessary to make people believe that a made-up language could really be spoken, and could be used to translate ideas. There was a reform of Volapük in about 1930, but it’s still complex. Though the words are actually based on English words, they are distorted— ‘animal’ becomes ‘nim’— so it can serve as a completely alien tongue in fiction. There are a small number of Volapük speakers today, and a Europe-based Volapük organization. In the Destine universe, Volapük is preferred by the tyrants ruling the Alliterist worlds. A few alien races use it, too. So, these are some of the actual conlangs which can be used by the modern writer. If you need a few names or magic words or an alien curse word or insult, these are possible sources. In early science fiction, Esperanto was new linguistic technology which seemed to scream ‘futuristic.’ That impression has changed, in large part because so many people on the planet don’t want to have to learn the international language Esperanto when they have already learned Chinese, Arabic, Spanish or English as their international language. It is commonly said that Esperanto has ‘failed.’ But since it has gone from just-an-idea with one speaker, Dr. Zamenhof, in 1887 to a language estimated to have 2-4 million speakers and maybe more who could recognize the language and communicate in it on a basic level if they had to. A later idea of how future people would solve the interplanetary language problem was a ‘universal translator’ device like used on Star Trek. The Star Trek device could start translating without hearing a word of a new alien tongue, as far as we could see on the show. But in the real world, translation by computer is hard. There are always mistakes. Would YOU like to create a treaty with the Klingons using only a ‘universal translator,’ or would you opt for using bilingual beings as translators so they could catch the mistakes and ambiguities? There has also been the idea that in the future, English or a version of English will be the interplanetary universal language. On Earth, our experience has been that a country with great military and economic power can induce foreign peoples of less power to learn their language, as the British Empire spread English and English-learning around the world. But our experience on Earth has also been that the most popular international language doesn’t stay so popular forever. Greek was an international language in the ancient world, and was learned by educated persons in many nations from Egypt to Israel to Rome. As Greek national power waned and Roman power grew, Latin became an international language. It continued to be an international language for a long time because the Church was centered in Rome, and the Catholic Church still uses Latin for international communications purposes. (There used to be an ATM machine in the Vatican with Latin instructions!) Later French became the language of diplomacy, and only later did English start being used for international purposes. In the future with the growing power of China and of the Muslim world, perhaps Mandarin Chinese or Arabic may have a turn at being the most popular international language. Adopting a created language like Esperanto is a different sort of thing. 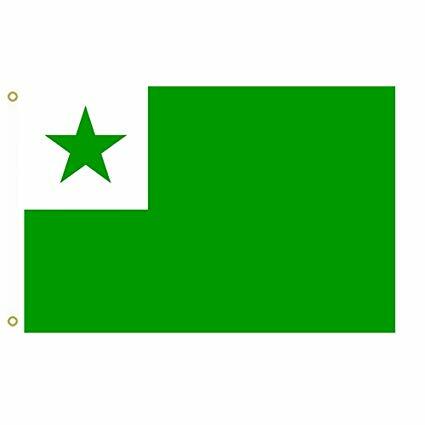 It does not belong to any one nation on Earth, and it is highly unlikely that if Esperanto moves out into the interplanetary world that any Esperanto-speakers will claim it belongs particularly to Earth. Like other created international languages, it belongs to the people who have taken the trouble to learn it in order to communicate better with others. It may seem that Esperanto or other similar languages moving into common use would require loads of people (and space aliens) to become more idealistic. But actually, it is pragmatic. I learned Esperanto well enough to read it by spending 2 month studying a book on it in my spare time while I was in college. This is a short investment in time as language-learning goes. Imagine how an international or interplanetary project would be enhanced by asking (or ordering) the participants to spend the small amount of time it would take to learn to communicate with others in Esperanto. Esperanto is not the first created language ever made as an international language. There were many such projects before Esperanto, such as Universalglot or Volapuk. Volapuk actually had a following and language clubs at one time! After Esperanto, there were languages such as Ido (an Esperanto dialect) and Interlingua. There are also languages like Slovio, a pan-Slavic language. In the future, a new international or interplanetary language could arise that is no relation to Esperanto, but has similarities in easy of learning. It’s possible that English speakers might meld English word roots with a simplified, Esperanto-like spelling system and grammar to create a new language easy for those who already speak English as a first or second language. Or Chinese speakers, or Arabic speakers. Now that Esperanto and other simplified languages have been created, the principles are available to anyone. What about Klingon for an international language on real-world Earth? There used to be internet rumors of how an English-speaking Star Trek fan had communicated with a Japanese Star Trek fan in Klingon. As a massive fan of Star Trek, I looked into that. I wanted to translate a few simple sentences into Klingon. But I found that Klingon had no words for the key words in my sentences, like ‘cat’ and ‘rat.’ And no mechanism for creating new words, which Esperanto has. And since Klingon is the intellectual property of Paramount Pictures, who hired the man who made up the Klingon language, we really can’t use it for an international language without permission. So an Esperanto club in Poland can’t transfer its loyalty to Klingon as an international language, as Volapuk clubs transferred their loyalty to Esperanto once Esperanto was invented, because Klingon isn’t in the public domain! As writers, if we like the interplanetary-language concept as a plot device, we are free to create our own interplanetary language— language inventing is a legit hobby now and there are web sites that may help you— or you can used Esperanto (or Volapuk or Universalglot) as a pre-fab language in your work. Since they are international languages meant for use, they were all ‘born’ in the public domain, and are old enough that they would be in the public domain now anyway. Esperanto is the best developed international language. There are free Esperanto learning websites and cell phone apps like Duolingo, there are still a few Esperanto shortwave broadcasts, and even more broadcasts in Esperanto on internet radio— including one on Vatican radio. Also, the Bible has been available in Esperanto from early on. The language’s creator, Zamenhof, was a Polish Jew and spoke Hebrew as well as many other languages, and he translated the Old Testament. Here is a sample: ‘En la komenco Dio kreis la chielon kaj la teron.’ [Genesis 1:1] The New Testament was translated by the British Bible society, and the Deuterocanonical books— the books in Catholic Bibles that modern Jewish and Protestant Bibles don’t have— are also now available. So the Esperanto Bible— especially the Zamenhof-translated Old Testament— is a treasure trove of grammatically proper Esperanto stuff to quote. I might warn other language geeks: don’t give out long solid blocks of text in Esperanto or your own fictional language or any language other than English (or whatever other language you are writing in.) It will confuse or annoy many readers, while using a word or phrase or two may be able to be ignored by people who don’t like that sort of thing. Sometimes, less is more! Imagine a futuristic story in which language diversity is a problem. How will your characters solve the problem? How will they get others to agree to their solution? What will be the drawbacks and benefits of the solution your characters choose? A major corporation builds a massive factory or mine or something, and has to get workers from many linguistic groups. The corporation hires linguists to create a simple language for the corporation workers to use with one another. Over time, children are born from ‘mixed marriages’ among the workers who use the (copyrighted) corporation-owned language as their primary or only language— and they can’t leave to work for other corporations because they cannot use their native language without corporate permission!